Delivers therapeutic levels of antioxidants. It combines organic elderberries, which are traditionally used to fight cold and flu-like symptoms, with organic elderflowers and organic wild blueberries. Suggested dosage: 1-2 tsp. daily. Dimensions (in packaging): 4.5" x 4.5" x 7.75"
Taste great. Take it every day. Wish shipping was cheaper. Heard about it. Taste great. Shipped fast. Giving it a try. This was a gift to my daughter. She loves it. Did you know the elderberry has the highest concentration of antioxidants of any berry in the world? It’s no surprise to Edie and Geo Johnston, who run the largest organic elderberry orchard in the U.S. The mother-son team founded Maine Medicinals with a mission to create plant-based medicines and herbal supplements from organic, sustainable sources. 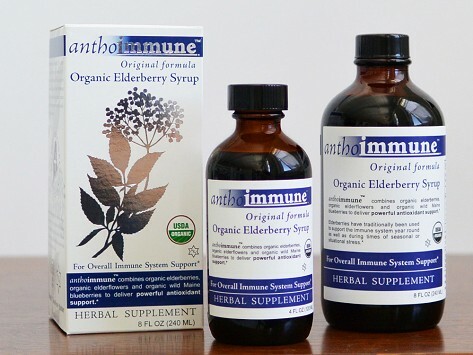 Their anthoimmune Elderberry Syrup combines elderberries, elderflowers, and wild Maine blueberries (grown by Geo’s sister Lindsay) to deliver a powerful antioxidant punch. 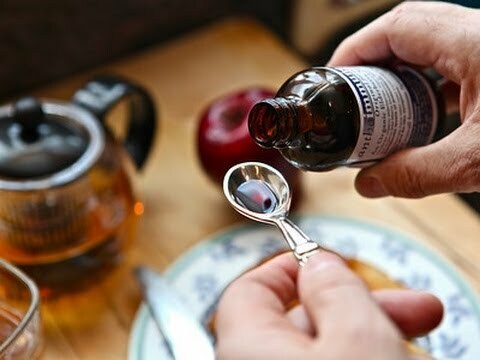 The syrup is designed for everyday use, to promote immune strength and help fight flu symptoms. You can take it straight (elderberries taste a bit like figs) or add it to a beverage, such as tea or a smoothie. The natural benefits of elderberries have been lauded for centuries. Hippocrates, the father of modern medicine, touted the health-giving properties of elderberries back in the fifth century B.C. With Edie and Geo’s elderberry syrup, you get the benefits of ancient herbal traditions—combined with the reassurance that Maine Medicinals is a certified organic processor and manufacturer of standardized nutraceuticals and herbal supplements. It’s the ideal ancient-modern combo.